The techniques used at English Chiropractic for your chiropractic adjustments will be tailored to suit your body’s unique needs. Traditional, manual techniques are available, as well as gentle, instrument-based methods. Cox Flexion-Distraction – This non-force approach uses a special table so we can traction your spine, relieving pressure to compressed spinal discs and facet joints. Diversified – After identifying which spinal bones have lost their normal motion or position, a specific manual thrust is administered to free up “stuck” joints. Selective Functional Movement Assessment – Dr. English is trained to assess your movement and determine which Foundation Training methods are appropriate for you. SFMA was developed by Gray Cook, MSPT. Thompson – Thompson Terminal Point technique is a system of analysis and a special table that reduces the amount of energy needed to adjust your spine. 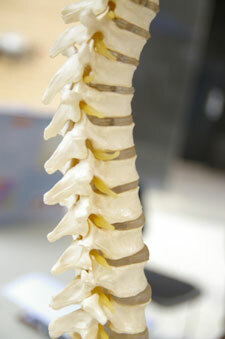 Exercise when combined with spinal manipulation has been shown to provide rapid and sustaining relief from pain. We incorporate exercise therapy instruction for most all of your patients. Foundation Training – We’ll assess your movement patterns for abnormalities. Based on your body’s movement, specialized exercises will be prescribed to get you feeling better quickly. Further exercise will be prescribed to help keep you feeling and moving well. An important part of most treatment plans include specific soft tissue therapy. Too often the muscular component of the subluxation complex is overlooked and can therefore slow down the healing process. Electric Muscle Stimulation – We use this special type of low level electrical current to stimulate supporting muscles of your spine, reducing inflammation and spasm. Massage –Several forms of massage and deep tissue manipulation are used for enhanced healing. Ultrasound – This high-tech deep tissue “micro-massage” helps reduce swelling, increase blood flow, decrease pain, reduce joint stiffness and stimulate cell-repair. We want you to relax, enjoy and fully benefit from your chiropractic care. Contact us today to schedule your appointment.